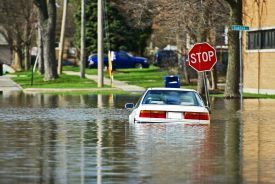 Flood Insurance in Ellinwood, Kansas - Jensen Associates, Inc. Flood damage can be devastating for any family, and most flood losses are not covered by your standard home insurance policy. Don't rely on the federal government to assist you in the event of a massive flood situation. Your standard Kansas flood insurance policy would apply to homes, condos, mobile homes, businesses, and rentals that are in flood zone areas. Typically, your flood insurance policy is dependent on your flood zone risk. Building coverage is designed to protect the structure of your home or business. Building coverage also applies to appliances and other property items that are consdiered part of your property including air conditioners, dishwashers and cabinets. You will want to consider converage for your personal property as well, such as furniture and clothing. Policies have different options so contact one of our staff at 620-564-2020 for any questions you may have about your Kansas flood insurance policy.